All fields of human activity - physical, mental and spiritual -depend on the power of our energy. Properly concentrated, it can generate tremendous creativity and dynamism. All human beings are capable of manifesting far higher levels of energy than is normally assumed. This book introduces you to the ait of awakening this extraordinary capacity already latent in your body and mind. 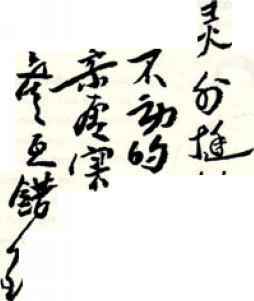 The techniques for personal development in this book have traditionally been practiced in the martial arts. But the high levels of energy they generate help to transform everyday life. They increase your stamina and brain power. The results work wonders in demanding professions. They give you resilience in high-stress environments and unlock astonishing creative power in the performing arts. The cultivation of human energy is one of the great achievements of the world's oldest surviving civilization. In the legacy of Chinese culture, the human being is understood to be a field of energy. Natural scientists and medical specialists have worked over the centuries to determine how best to sustain, replenish and enhance this vital energy, known as Chi. pronounced "jam jong." It is most commonly known as Standing Like a Tree. The stationary postures stabilize the body and unblock the flow ofChi. At a later stage of practice, they can be combined with carefully designed movements to generate remarkable strength. This seal contains the characters for Zhan Zhuang Kung - The Art of Standing Like a Tree. Because Chi Kung exercises are so effective in raising our energy levels, they are often used as basic training for martial arts. The practice of Zhan Zhuang is the foundation ofone of the most potent martial arts known to the Chinese as Da Cheng Chuan, which means The Great Accomplishment. 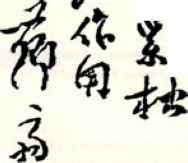 Da Cheng Chuan was the crowning achievement of Grand Master WangXiangZhai (pronounced "wangshang jai"), who journeyed for more than ten years throughout China in the first part of the 20th century, studying under the great masters of his day. In the 1920s, he began sharing the fruit ofhis research with students in Shanghai and later in Beijing. While there are said to be few, if any, martial arts systems more powerful than Da Cheng Chuan, you experience its enduring benefits as you go about your life and work. Your mind and body become exceptionally alert. Your mental and emotional faculties are refreshed. You experience greater resilience under pressure and recover more easily from illness and injury. As you work through this book you will find careful instructions, meticulously illustrated. These take you from the first stages of practice through to advanced levels previously unpublished in the West. 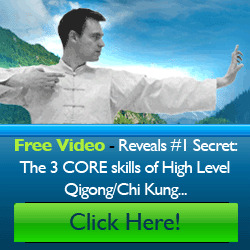 You will be taught how to employ the Five Energies system in the higher levels of Da Cheng Chuan (see Part Four). You will also learn the way in which precisely controlled movements can be coordinated with essential postures to raise the body's energy to dramatic levels. However, as with all arts, the fundamentals must be understood first and then used as a basis for further achievement. No matter what level of accomplishment you reach, the energy work in this book will start to generate enhanced inner strength. With careful practice you will be able to use and direct that power in all aspects of your daily life. If you are completely new to the practice of Zhan Zhuang, it is vital that you first open the gateway to this art. Daily practice is essential, beginning with the three warm-up exercises described below. Then devote yourself to the standing postures on the following pages. Relaxing the Shoulder's With your feet shoulder width apart, slowly raise your arms as if lifting a ball. Breathe in with the upward movement. Turn your arms outwards and gently lower them back to the start, breathing out. Don't hunch your shoulders or stiffen your arms. 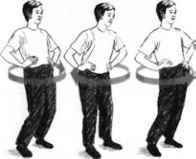 Make at least 30 complete circles with your arms. With your feet shoulder width apart, rest your hands on your hips. Slowly rotate your hips 30 times to the left and 30 times to the right. Keep your head gently upright. Let your abdomen soften and your lower back relax. Breathe naturally. With your feet together, bend your knees and rest your hands just above them on your thighs. Slowly rotate your knees 30 times to the left and 30 times to the right. Try to keep the soles of your feet flat on the floor. Breathe naturally. Once you have completed the warm-up exercises, you should undertake the practice of standing still in the following postures. Begin with the first posture, Wu Chi. Stand still in this relaxed position for at least 5 minutes a day, then gradually increase your standing time to 20 minutes. This practice is a powerful self-treatment. As you become stable in the Wu Chi posture, your internal energy naturally seeks out accumulated tension and underlying imbalances throughout your system. The detailed instructions on pages 26-27and the advice on inner strength on pages 34-35 will help you. Stand still with your feet shoulder width apart. Relax your knees, belly and hips. Let your shoulders naturally ease downwards. Your arms hang loosely by your sides. Your fingers are slightly apart, naturally curved. Lower your chin a little and relax your neck. Look forwards and slightly downwards. Breathe calmly through your nose. Once you have accomplished the practice of standing in Wu Chi for up 20 minutes daily, do the same with the following sequence of positions. Always begin with your warm-ups and an initial 5 minutes of standing in Wu Chi. I. Holding the Belly With your feet shoulder width apart, slightly lower yourself as if resting your bottom on a large ball. Bring your hands in front of your lower abdomen as if gently resting a large ball against your belly - or as if you had a very large belly on which your hands are happily resting. Your fingers are gently spread apart and your shoulders completely relaxed. You continue to sit on an imaginary ball. Your arms form a comfortable circle as if holding a ball between your open palms and your chest. Your elbows sink a little lower than your hands and rest on small imaginary balloons under your arms. Keep your chest and shoulders completely relaxed. 3. Extending to the Sides Keep the same body posture and extend your arms out to the sides, slightly in front of the line of your body. Relax your shoulders and slightly bend your elbows. You feel as if you are resting your hands on two balloons floating on water. 4. Opening Outwards Open your hands outwards as if pushing a large ball away from your face. Lower yourself a little further, making sure that your knees do not bend forwards over your toes. 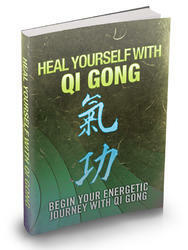 At the end ofevery Chi Kung session, it is important to seal into your body the energy you have generated. This applies to the foundation postures and all the positions and movements in the rest of this book. This position seals your energy into a reservoir just below your navel, known as the Sea of Chi. In Chinese, it is called the Tan Tien (pronounced "dan dyen"). As you practice the standing postures and movements in this book, your mind is free to roam and experience the thoughts and feelings passing through it. Keep your eyes and ears open to whatever is happening. You can listen to music, even watch television as you practice - flowing music and non-violent channels are preferable. Remain upright, preserving your balance, and devote yourself to the inner relaxation of your being. Everything will flow from that in its own time. Stand in a relaxed, upright position with your feet shoulder width apart. 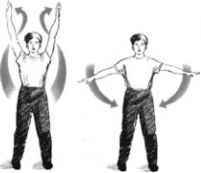 Place your right palm over your lower abdomen. Then place your left hand comfortably on top of your right. You can lower your eyelids, but keep your eyes open to avoid losing your balance. Rest in this position for between two and five minutes. Breathe naturally. 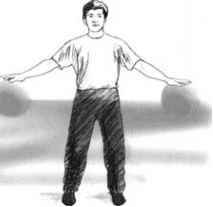 Is wuchi..the first posture in zhan zhuang a good chi kung exercise to do by itself...? Are the basic zhan zhuang positions good for treating osteoarthritis in the shoulders? Can zhan zhaung treat osteoarthritis?